Watch the video above to learn about the photography workshop experience. 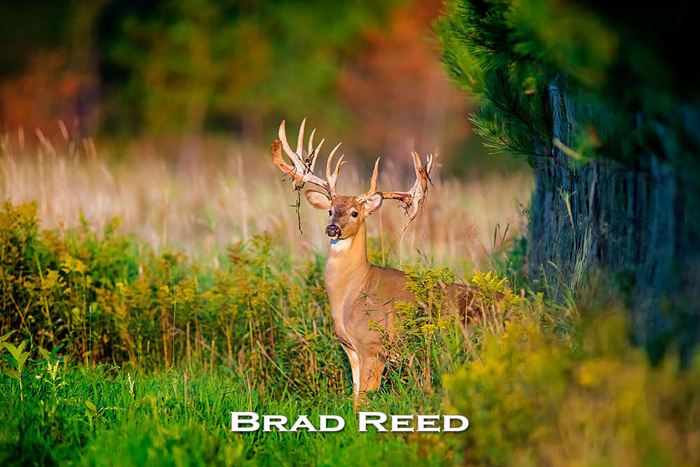 Todd and Brad Reed offer Photography Workshops throughout the year. Picture Perfect Weekend Workshops are for total beginners as well as seasoned professionals who have been shooting for decades. 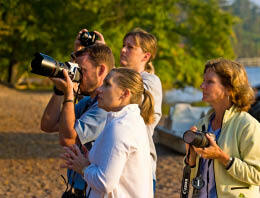 All photographers will learn and benefit from the Picture Perfect Workshops. Todd and Brad cover many technical aspects of photography, including shutter speed, F-stops and aperture, ISO, depth of field, etc. Their goal is to teach people how to make better choices with their own camera...and to have a thrilling experience while learning. Price for the workshop is $400, which includes food and refreshments. Lodging at Cartier Mansion is NOT included. To register for the workshops, call the Todd and Brad Reed Gallery at 231-843-0777 or stop in to the downtown gallery. Each workshop must have a 10 person minimum and is limited to the first 15 people to sign up. You must have taken both of the Reed's first two weekend workshops to take this class. Cost is $795 that includes a $250 non-refundable deposit. Class is limited to the first seven students. 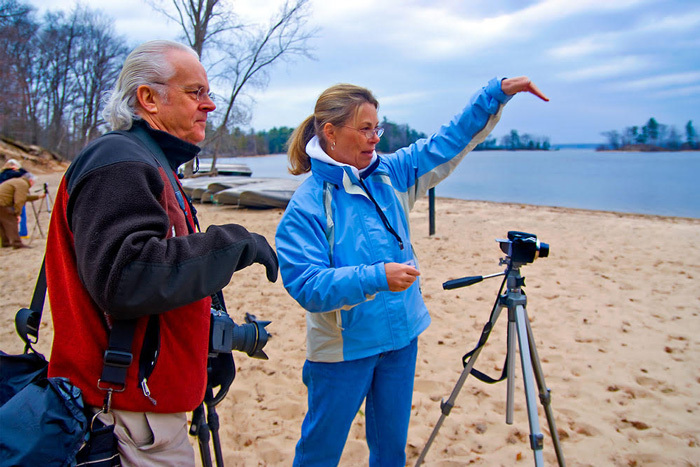 Participants stay at a home on Hamlin Lake, offering a great opportunity for a high level of personal interaction between photographers. You will have your own bedroom and several bathrooms are available. Lodging, all meals, and workshop fees are included in the price. You must have taken the non-advanced Picture Perfect Weekend workshop before signing up for this workshop. Class is limited to the first five students who sign up and pay $1,500 in full. Stay at a lodge in Bitely and have an executive chef prepare your meals. Each student has their own private bedroom and bath. Participants will have the opportunity to some of the largest whitetail deer in North America as well as a variety of other wildlife. You must have taken the non-advanced Picture Perfect Weekend workshop before signing up for this workshop. The environment in the Porcupine Mountains can be challenging terrain. The workshop involves hiking and climbing over often-slippery rock. The workshop focuses on instruction in creating storytelling images and selecting images to layout in a "Snapfish" type book which will be shipped to students after the workshop. The workshop is limited to five students. The cost is $2,500 paid in full and includes lodging, instructional fees, picnic lunches and the cost of the book. The student is responsible for remaining meals and transportation. At least 6 different prints (any size) of your best work for critique. These must be printed out on paper or photo paper. They can be your favorite shots, even if they didn't turn out. We can help you figure out what went wrong. A camera (film or digital) and instruction manual. Bring lots of batteries for your own kind of camera. Remember that cool evenings on Lake Michigan can eat up battery life. A working tripod that works with your own camera would be strongly advised. Dress for the elements. It can get pretty cool on Lake Michigan, even during the summer. Good hiking shoes for walking in the sand and on the water's edge is recommended for people who get cold feet. Waterproof boots are recommended. A good hat that you can put in your pocket and taken out in case you need to protect yourself from the winds coming off Lake Michigan. And, of course, gloves that are easy to take on and off while you are taking pictures are also recommended. 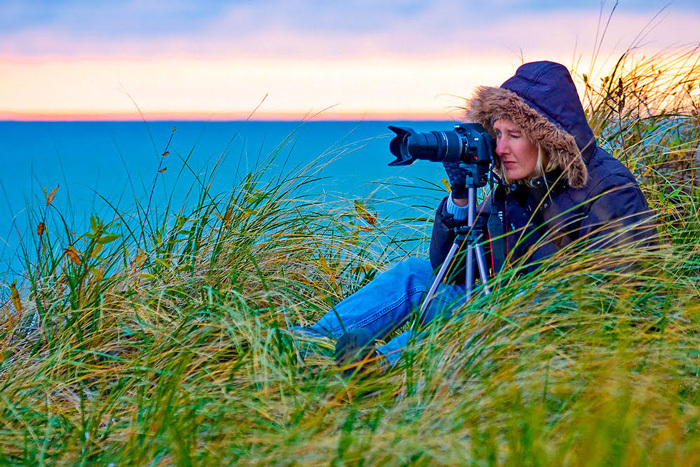 You never know what the weather will be like on the shores of Lake Michigan. Hopefully it will be warm and beautiful, but if not, it is worth it to be prepared. The Reeds shoot in almost any weather and the best shots usually come during storms!